Yeah, yeah, I know. 95% of you just made new year’s resolutions to eat healthier. And here I am tempting you with chocolate mousse. I’m kind of evil. Plus, I’m looking out for the 5% who didn’t make such lofty goals…there is far too much health food talk going on around the food blogosphere right now. We want chocolate. We need chocolate! Resolutions be damned, this mousse is too good not to share. For those of you who are crazy enough to have cut sugar and/or chocolate out of your life, well, just tuck this recipe into the back of your brain for a day that you feel like cheating. After Thanksgiving I had a hankering for some honest-to-goodness chocolate mousse, mousse without whipped cream mixed in. I did a little web search and came across a blog post by David Lebovitz where he had made Julia Child’s recipe. Since both of these people are beyond trustworthy in the chocolate department, I decided to give it a try. All I have to say is Julia knows her chocolate. It was beyond rich and the texture was just what I was looking for. Ooo. La. Laaaaa. Observe the texture. THAT is mousse. Warning: you may die eating this mousse. That is how rich this dessert is. A dollop of whipped cream on top is advised. Warning #2: This recipe requires lots of bowls. That’s just how Julia rolls. Melt chocolate and butter in a double boiler over simmering water until smooth. Remove from heat. Remove from heat and place the bowl of whipped egg yolks within the bowl of ice water and beat until cool and thick, as shown in the photo above (Jane note: again, I used an electric mixer). Fold the chocolate mixture into the egg yolks. 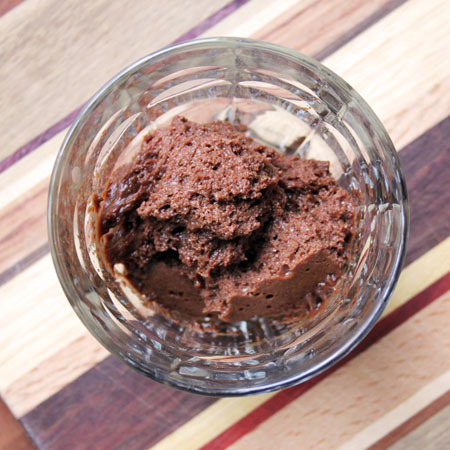 The mousse can be refrigerated for up to 4 days. Servies 6-8. Soo making this once baby is weaned. Good find, I’m not a fan of the whipped cream ones either. Hm…tempting. Oh so tempting. It’s this dang “no sugar” thing I started…well, actually I already changed it to no desserts. Some sugar can’t be all that bad, right? Is this recipe even legal in all 50 states?! This is a perfect (make ahead!!) dessert for my chocolate-loving family. I am a chocoholic and so need my chocolate. A do ahead chocolate mousse, fantastic. I’m so sad about not being able to eat egg whites anymore FOR THIS REASON. Chocolate treat in the morning on a nice summers day. That seams like a nice morning on my day off. I made this and piped it into meringue shells, topped with a drizzle of raspberry. Absolutely divine. I made this and it turned out a little crunchy. Just wondering if that was because my sugar hadn’t fully combined with the egg yolk? Instead of superfine sugar, I used an organic sugar. Or perhaps the mixture crystallized at a later point? Pretty delicious anyways but not quite as smooth as I expected. I also froze it immediately after making to quicken the cooling time. Here is my issue. I am not allowed to make any desserts with white sugar in them. I know, silly, but the people I cook for insist on only unrefined brown sugar, called panela. I’m in Ecuador, and the homemade bitter chocolate varies, but it can be exquisite. So my regular mousse is about 60/40 industrial bittersweet/homemade extremely bitter. Now I have to go straight bitter and sweeten it, and the fat ratio has gone to pot. It turns out slightly runny on the bottom. Ew. Any ideas? The butter here has a higher water percentage as well. I’m going to try this with Splenda Sweetener instead, because of type 2 diabetes and I’m also lactose intolerant, thus the heavy cream free version for me. I’m wondering how this mousse would fair if paired with delicate crepes? I think I should try. I wanted to suprise my mom with some mousse but I can’t drive and I only have .5 oz of chocolate. Is there anyway I can use that .5 oz and some unsweetened cocoa powder? I’m not sure it will work, BUT…there is a conversion you could try. I think this would be too many changes for mousse and make the texture not work. both of those recipes will handle the chocolate conversions much better than the mousse will. Thanks for this. Subbed in 6T strong decaf for the water and used the mousse to fill my Yule Log cake. Super wonderful! love that coffee substitute – fantastic idea! 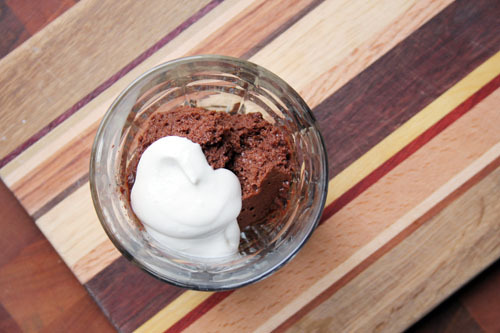 wish I could have had some of that yule log – filling it with julia’s mousse is a darn good idea!